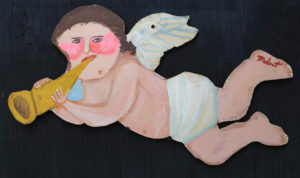 Myrtice West has painted some of the most passionate and important work in the field of contemporary folk art. Her life story is a most fascinating one. 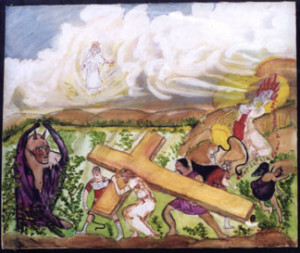 When asked, Myrtice West eagerly explained what is symbolized and why in each painting. The interpretation of her religious art is a responsibility that she took more seriously than eating or sleeping at times. Myrtice West was born in l923 in Cherokee County, Alabama. She lived most of her life within a few miles of her birthplace on a farm in the foothills of north Alabama She married at an early age and within a few years was told that she could never bear a child. 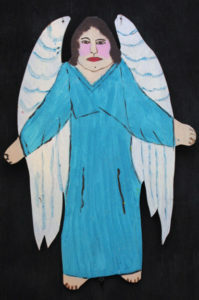 Unhappy, she began to paint and draw for therapy. 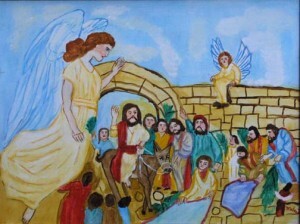 She spent years painting scenes from her area on whatever she could find, often painting over old discarded paintings. She was fascinated with photographs and sometimes would paint over them. Then after seventeen years, she became pregnant. “We were like Sarah and Abraham, having a baby at our age. 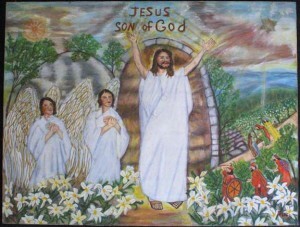 But God answered my prayers.” When a daughter was born, she began painting some religious scenes. It was not until years later that Myrtice was “called to paint Revelations.” This occurred in a series of night visions, according to Myrtice. She prepared the largest surface she could find. 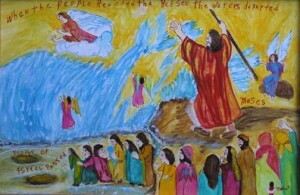 Myrtice said that her hand did not draw that first painting of Revelations that was created in the middle of the night. 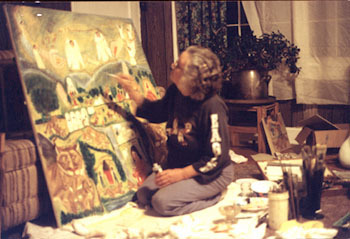 “I was as surprised as my husband when the sun came up and we seen what I painted all night!” She was driven, obsessed, to paint these oil paintings, often working six hours a day. When one was completed, another chapter of Revelations followed. 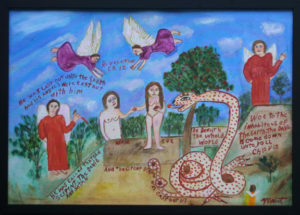 Myrtice continued to paint series from the Bible during the 1990’s, including the whole books of Ezekiel and Daniel. She was honored by the Alabama State Arts Council several times and her work has been widely exhibited in galleries and museums. In early 2000 tragedy struck again. The antebellum home that Myrtice had lived in for most of her adult life burned to the ground. 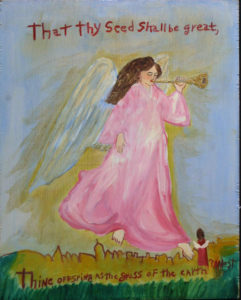 Only a few of the paintings in her possession survived the fire. She moved to an apartment nearby and lived with her granddaughter and great-grandchild until her death in 2010.